The Horse Shoe Farm is an all-inclusive Asheville equestrian center spanning 85 acres along the picturesque French Broad River in nearby Hendersonville, North Carolina. The pristine pastureland is encompassed by the beautiful mountain vistas of the surrounding Southern Appalachians. Although the farm features a sense of seclusion, it’s just a ten minute drive from the Asheville Regional Airport. And it’s also located a mere thirty minutes from the renowned Tryon International Equestrian Center. With over 50 acres of fenced pasture, an outdoor riding ring and a number of field run-ins, The Horse Shoe Farm is a well-equipped Asheville equestrian center. Board your horses in The Stable House, which boasts fourteen spacious 12′ x 12′ stalls, eight of which are heated. A horse feed room, wash stall and tack room are also available to accommodate all of your horses’ needs. But The Stable House isn’t just a luxury lodging option for horses. We restored the building’s second story loft into a modern, spacious vacation rental. Sleep peacefully above the stables in the five bedroom, three bathroom loft. The open-concept kitchen and living space make for a great gathering space. And the elevated deck offers dramatic sunset views over the farm. 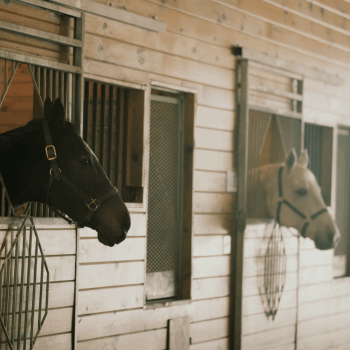 Whether you’re in town to visit friends or attend the Tryon International Equestrian Center events, avoid the hustle and bustle of downtown Asheville by staying at the nearby Horse Shoe Farm. Board your horse in a stable fit for a king. Feed your soul at The Silo Cookhouse, the farm’s residential restaurant with indoor and outdoor seating. Meditate each morning during a relaxing yoga class. Whatever you choose to do, it’s sure to make for a memorable experience. When you’re ready to stay at the most unique Asheville equestrian center in the area, book your stay at The Horse Shoe Farm. Enter the information below to receive monthly updates and announcements from the farm.